With Christmas around the corner, you probably already have a wish list for Santa from your kids. But if you are thinking about buying a big surprise gift for your kid and do not know where to start then we have a great idea for you. 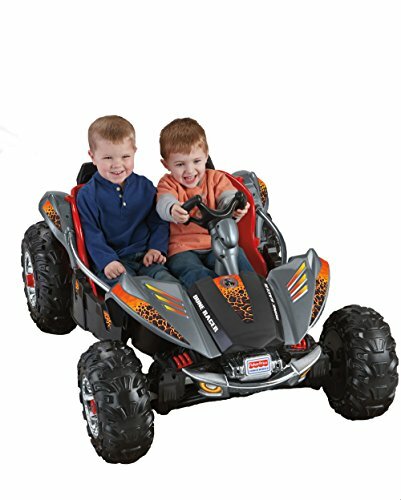 If you have a little human in your house that loves to mimic you while you drive, then a dune racer is what you need to get them driving on their own. And since you don’t want something so flimsy that their first ever car driving video ends up in a funny videos compilation, we recommend to you only the best in our Power Wheels Dune Racer review below. Read on to find out if this is what you want for your precious little one. The outstanding feature of the dune racer is the monster traction system which enables it to run on hard surfaces, wet grass and bumpy terrain. Backyards tend to have little twigs, branches and even garden hoses that can come in the way when kids are driving, but the dune racer rides over them without a problem. It is also stable enough to prevent toppling over in such cases. As the recommended age group is 3 to 6 years, the Power Wheels Dune Racer comes with two speed settings viz. 2.5 mph and 5 mph. The reverse speed is set to 2.5mph. The slower forward speed setting allows beginners and kids in the lower range of the age group to get a hang of the machine while the higher speed is ideal for older or more experienced kids. What’s even better, to avoid younger kids from accidentally going faster, the higher speed setting of 5mph comes with a parent-controlled lock out feature. Once the kids are ready to drive at the higher speed, the lock can be removed. There is no hassle of using a separate brake pedal as the accelerating foot pedal doubles as the brake. The power-lock brake system automatically brings the vehicle to a stop as soon as the foot is removed from the pedal. The dune racer has a simple no-nonsense design with minimal operating parts to help kids have fun without having to focus too much on the driving. The foot pedal kick starts the vehicle and helps in accelerating. It also acts as the brake when the foot is lifted of the pedal. The same pedal works in the reverse when the reverse mode is on and the steering wheel helps in changing directions and has a good turning radius. So within just a few rides, you kids will be driving the dune racer like a pro. The vehicle has been designed to accommodate even taller kids easily as there is no dashboard that comes in the way. Even the steering column is well placed and compact without causing any obstruction or discomfort to the kids. So kids even beyond recommended age group can actually drive it without a problem. The bike has been constructed using quality components to be sturdy enough. It has a steel frame that can accommodate a weight of up to 130 lbs. The sidebars that are there for hand support are also made of metal. Putting the parts of the racer together is very easy and the instructions on the manual are very easy to follow. Your kids can play longer on this racer without worrying about the battery dying on them in the middle of play as the battery lasts for more than 2 hours. The vehicle comes with a 12 volt battery pack and a charger in the box. The car seats are nice and spacious bucket seats that can accommodate even older kids. Due to the open cockpit design there is a lot of room for comfortable seating. As there are two seats, it simply makes it more fun for you kid as they can have a friend by their side. The extra seat can come in handy especially for a smaller kid who cannot yet reach the pedal to drive themselves but can still enjoy the ride by being a passenger. There is also a thoughtful storage space under the hood for you kid to take along his favorite toys and a water bottle or a juice box so that there is nothing to interrupt the fun. Driving the dune race gives the kids a kick start to driving and learning to be independent. It gives them a chance at grown-up role play and a sense of accomplishment. It’s just not all about fun as it also promotes motor skill development and helps them learn about ‘cause and effect’. Just one look at the dune racer will tell you that it is not a flimsy or toyish looking vehicle. The frame is made of quality steel for a long-lasting performance. The fairings and tires are also made of hard plastic that can take quite a beating. The vehicle also comes with a limited one year bumper-to bumper warranty against manufacturing defects and is backed by 300 service centres in the country for a complete peace of mind. The dune racer is high on features and hardly has any negative points. Nevertheless here are a couple of them that may be considered as cons. Smart looks – The Dune racer is no flimsy looking toy car and looks solid and smart with its sturdy construction and comes in a variety of great colors to choose from. There is even a Power Wheels Dune Racer pink for the Barbie lovers. 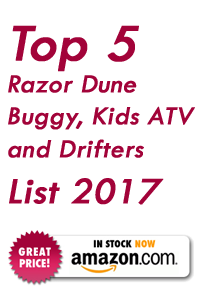 Great price – The Power Wheels Dune Racer price is great value for your money as your kids do not grow out of them soon like most other toys and can use it for a very long time making your purchase really worthwhile. But if that wasn’t enough you can even get a Power Wheels Dune Racer cheap if you find them on sale. Many online stores slash down the prices and have offers from time to time. Kids need to have their time outdoors and it doesn’t have to be the swing or the slide all the time. The Power Wheels Dune Racer by Fisher Price is a great way to introduce your kids to the fun world of driving, in the safety of your backyard or your neighborhood as it is designed for driving off-road. This four wheel vehicle is sturdy, safe and well-built for little and older boys and girls to drive around. And it comes in such lovely colours and decals that it will be a sure hit with them. What’s even better, it comes at a very affordable price and as the kids don’t outgrow the vehicle for a really long time, it gives you more value for your money.